The 39-year old Jamaican became the first cricketer in IPL history to smash 300 sixes in the cash-rich T20 tournament. Already leading the charts by a massive margin, the 39-year old required just two more to touch the magnanimous 300-mark before the encounter versus Mumbai at the IS Bindra stadium in Mohali. Gayle achieved the landmark in his 114th IPL innings while facing the 2719th delivery. 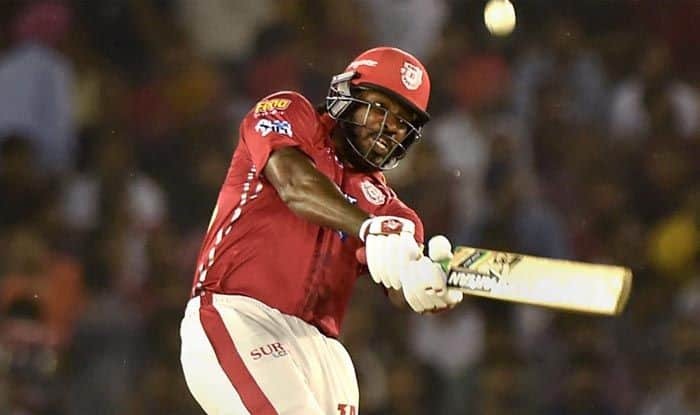 In the list of biggest six-hitters in IPL, Gayle is head-and-shoulders above the rest in the table with AB de Villiers being the next best with 192 sixes in 143 games followed by MS Dhoni with 187 sixes. The burly Jamaican had amassed 4133 runs from 114 matches at an impressive average of close to 42 with six hundreds and 25 half-centuries against his name. Right from the start of the 12th edition of IPL, Gayle has been in superb form with the bat. He is the sixth highest run-scorer this season after first two games with 99 runs under his belt. He scored 79 in the first match against Rajasthan Royals, a match in which he also won the man-of-the-match award. During that knock, Gayle had also broken David Warner’s record to become the fastest player to reach 4000 runs in IPL. Warner, who plays for Sunrisers Hyderabad, reached the milestone in his 114th innings and became the first overseas player to get to 4000 IPL runs. Gayle stormed to 4000 runs in his 112th innings and 113th match.